But even if you have the best possible gear you still need to see the moon. So, check the moon phase calendar, weather forecast and head to a dark location. Usually cities have way too much light pollution and this reduces the contrast between the sky and the moon. Find a dark area with solid ground for your tripod. Then set up your tripod as stable as possible. Do not extend it completely unless really necessary. Select your telephoto lens with longest focal length and remove any filters you have. Even high quality filters can cause unwanted flare. Use low ISO setting to avoid noise - ISO 100 works well. I do not pay attention to white balance as I shoot on RAW which allows more post processing options. Use mirror lock up if available and use long timer to trigger the shutter. These help to reduce camera shake and therefore improve image quality. The choice between manual and automatic focus is up to you. When using a lens without distance view the autofocus might be a better option. Finding the right aperture for your lens needs some experiment. Most lenses have their sweet spot around f8-f11. Any higher aperture number causes diffraction which reduces image sharpness. Too low aperture number leads to soft photos especially on cheaper zoom lenses. After all this setup the last step is to aim the center of the moon and select the right exposure. 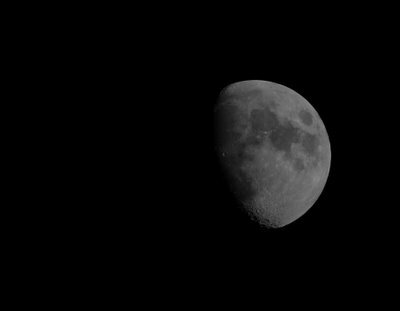 There are calculators for moon photography but couple test shots give you a good idea anyways. Depending on your camera its exposure metering it might give totally misleading results so feel free to ignore it. Take plenty of shots with different aperture and exposure times. At the post processing I use only green color component because it seems to have less noise compared to red. I also reduce saturation so the end result is black and white. Apply some sharpening, crop tight and upload to your favorite image gallery for feedback.